What was the last great view you’ve taken in? Maybe it was a pile of your own freshly-folded laundry, cleaned and sorted by anyone but you. Could it have been a surprise goal at the end of your child’s soccer game, finally giving his team a struggled-for victory? Maybe it was just opening a box of piping-hot pizza, feeling that amazing smell drift your way as you eye your first piece and suddenly notice just how hungry you are. Great views may be everywhere, but you can’t always plan for them, and some of them fade pretty quickly. How does booking a great view and taking it in for hours, even days, sound? At our Gatlinburg chalets, you can do just that. Owls may be able to turn their heads around 270 degrees, but you won’t need to do that to take in the massive view at the Owl’s Nest. Just stroll from one end of your huge wrap-around deck to the other! This 2 BR/ 2 BA relaxing A-frame chalet comes with incredible amenities, including a hot tub, picnic table, grill on the deck, free WiFi throughout, a wood fireplace, a large updated kitchen with all the standard appliances, an impressive vaulted living room, and access to 3 Chalet Village clubhouses with a pool, tennis, fitness center, and a game room. Owl’s Nest is one of the chalets in Gatlinburg that is dog-friendly, as well, so even Fido can take in the sights! Gatlinburg Chalets with the Best Views? When Pigs Fly! If you’re looking for a view-lover’s paradise, you’ve found it. When Pigs Fly includes both an upper-level deck, lower-level screened-in porch, and an outdoor seating area, all so you can take in the unbeatable sights of the Smokies. 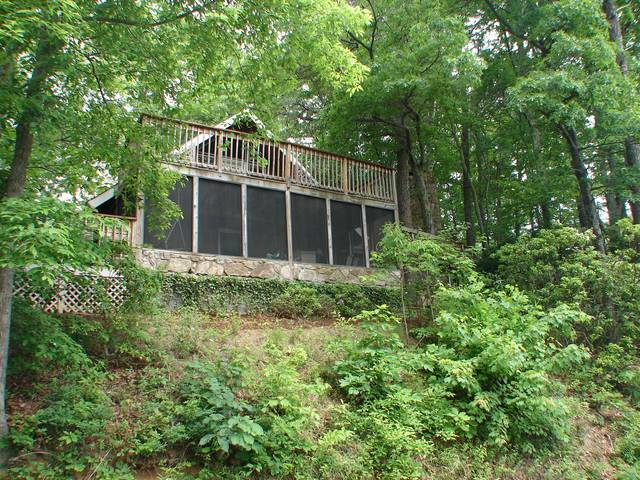 Gatlinburg chalets that offer that classic mountain ambience aren’t always available, which is part of the reason why this 4 BR/3 BA chalet is such a gem. It features 1 King-size bed and 3 Queens, 2 hot tubs, a gas fireplace AND a wood-burning fireplace, a game room with a pool table and shuffleboard table, 6 TVs and WiFi throughout, a fully-equipped kitchen, and a washer/dryer. Can you imagine sitting on a porch swing, swaying gently as you take in the view? What about enjoying it from the on-deck hot tub? Or the upper-level lounge chairs? If you’re ready to feast your eyes, you’ve got a buffet of choices. There’s nothing like appreciating a view after a long, tiring day, and Gatlinburg, Tennessee has everything you need to get the right kind of relaxation in. Whether you’re looking to lounge after a day on the links, on the zipline course, or after hiking through America’s most-visited national park, Great Smoky Mountains National Park, these chalets in Gatlinburg keep you close enough to the action so that everything’s convenient, but tucked away enough so that you have peace and privacy. It’s the best of both worlds! The View is Yours, If You Hurry! The summer season is upon us, and that means that everyone wants a vacation! Don’t wait until it’s too late before you book. Reach out to the team at Ski Mountain Chalets, and let them set you up with chalets in Gatlinburg with a panoramic views for you to enjoy. Reserve yours today!